Teaching older children their language arts lessons when they just can’t focus. 2. Note: Children’s Reading Program known as Ring Around the Phonics has all you need to teach phonics and reading (early reader books are included with the game), but is also designed to work in conjunction with “Bob Books and. Public school’s early reader books. Once a child learns their first 8 sounds (s, a, m, r, n, t, o, d), they should be able to read their first early reader book. After learning i, b, c, e, g and long a, they should be ready to read their second book…so on and so on. 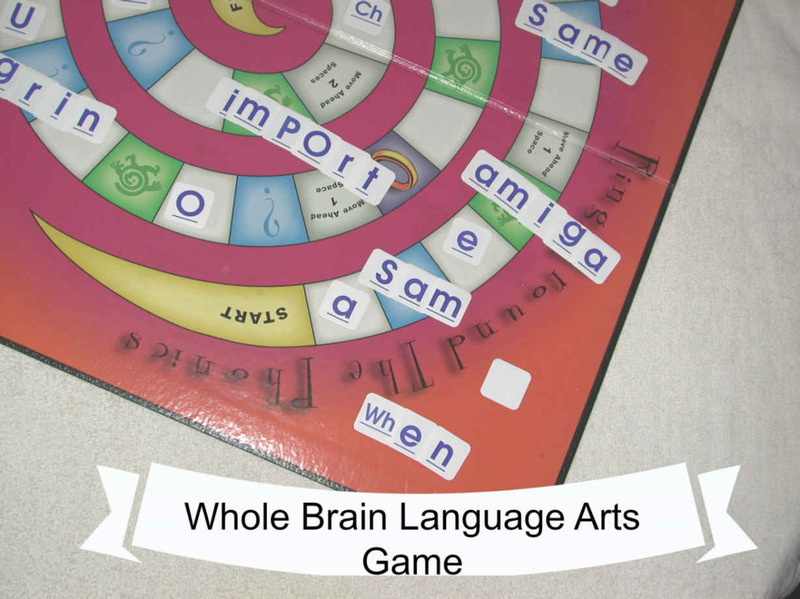 But the Children’s Reading Program known as Ring Around the Phonics can be used to teach blending for those who do not easily transition from the game to the books. I will often place something like the letter S in the first white square, the letters Sa in the next white square, and the letters Sam in the following one. If a child is able to read everything on the board, but not in a book, that is often because they have had trouble reading before, and think something is wrong with them. In this event, I stop playing the game, and place the word they are having trouble reading anywhere on the board. Then I keep pointing at the word in the book (that they are having trouble with), and back to the word on the game until they grasp the concept that if they can read while playing, they can read the book. Teach Foreign Languages is another way to use Ring Around The Phonics. 2. Another mother informed us that after she taught her children to read with the Children’s Reading Program known as Ring Around the Phonics, she began teaching them “basic Spanish.” It dawned on me, of course, one could teach any foreign language that uses the same alphabet. (note a few blank letter cards are included so you can add some of the unique letters found in many languages). 3. There are 336 static cling letter cards that can be placed singly or side by side on the board to teach phonics, phonic blends, syllables, prefixes, suffixes and root words which improves their spelling, vocabulary and strengthens their ability to read the large words that so many children struggle with. For example one can place the word “in” one white square, “formation” on the next square , and mis within the next (talking about its effect on the meaning of words). The following square might be left blank so you can ask the child to write the word misinformation, or better yet decode it in written word (book or workbook). Comprehension, Listening skills, Communication skills and writing skills. 4. Employers complain that young people are interning the workforce with tech skills, but no communication or creative skills. That is why whole brain teaching is so important. The game comes with activity and question cards that are not only fun, they help active children release energy so they can focus better. More importantly they also teach children comprehension, communication and listening skills. 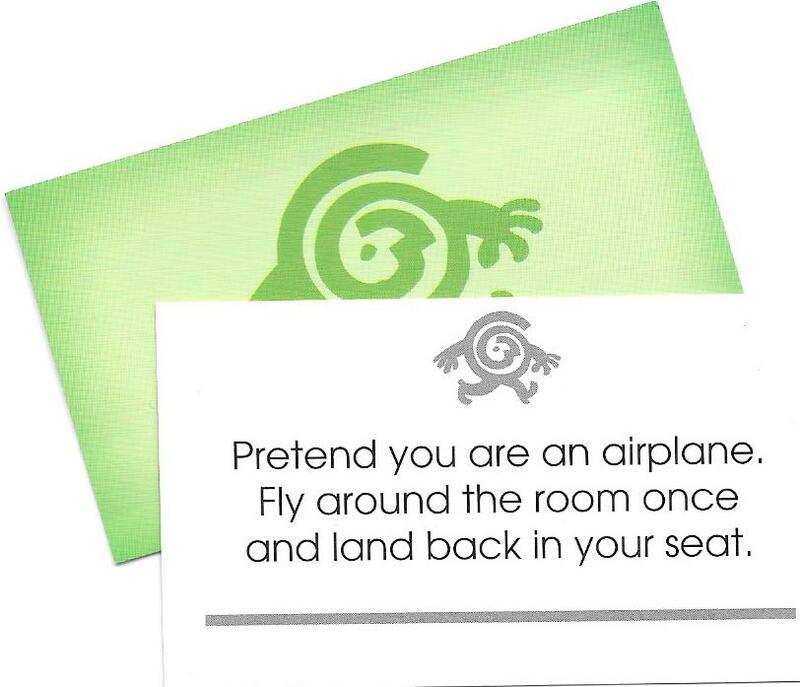 For example: One of the green activity cards says, “Pretend you are an airplane, fly around the room one time, and land back in your seat.” If they fly around and around, I say, “Oh my, someone is not listening.” It is so cute to watch the little ones rush to their seat for your approval, because if they fly around only once, I say, “look at you (their name) you are a good listener, aren’t you.” (Note: Children have the right to pass on any of the cards they so choose. One of my gifted children chose that option as a seven year old, but as an eight year old chooses to do the activities). Example 2: The blue Question cards teach communication and listening skills. Because of so many technology games, many children are not learning the communication skills so necessary for success in social and work environments. 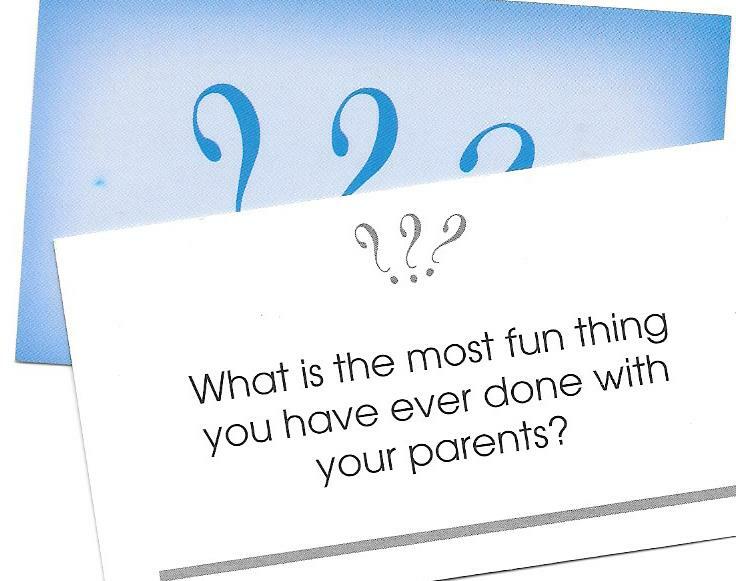 Older children write their own question and activity cards, which encourages creativity and writing skills. 5. Working in the Florida SES program as a tutor, I can attest to the fact that the Children’s Reading Program known as Ring Around the Phonics is great for the “Turnaround Schools”. 10. Here is something I love to do with the game. By placing one child’s activities on the white spaces, a second child’s on the blue spaces, and a third’s on the green spaces. (Note: continue the game as usual) You can teach up to four children at the same time even if they are of different ages, and learning at three different levels or subjects. I almost always have the older children do their activities as well as the younger ones because it is amazing how much the little ones learn from the older children, and how much the older children learn from teaching. It is much like the techniques used in the old one room school house. I play along only if there is just one child playing, and take my turn first. As I say a sound from the letter cards, it is amazing to watch the child. They often visibly rehearse the sound…not because they want to learn phonics, but because they want to beat me. 11. As children get older they are asked to read their own activity, and question cards included in the game, or to write their own, which becomes a writing activity. 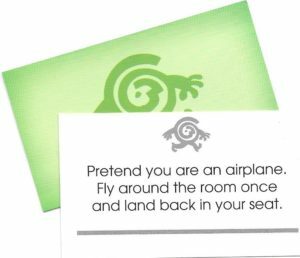 One gifted seven year old wrote a card that said, ‘You go back to start.” He kept rigging the deck so I pulled that one It was more fun to watch him giggle when I pulled this card, and moved my character back to start. Blank cards do not come with the game, but the cards in the game are the same size as a standard business card. I simply purchase the blank ones which are sold in most office supply stores. By writing your own cards you are able to use them to teach history, The Constitution or even math. The Game Is Fun, Because It Taps Into The Natural Way Children Learn. 12. As the children progress around the board, they get excited about winning a “gold and blue ring of knowledge” to crown their character. They love the activity cards which not only release energy for improved focusing, but also teach comprehension skills using whole brain teaching (physically involving them in the learning process). Each child finishes as a winner no matter the order in which they finish. Recently I was using the game to teach a 2nd grader, two 5th graders, and one 4th grader. The fifth grader began telling me that “the other tutor used this game, but the way she did it was boring. I like the way you are doing it.”, he said. Out of curiosity, I questioned him, and he explained that she only used the letters, and she did not use the question and activity cards nor the blue and gold rings of knowledge. Young children learn best while at play, and at real life experiences (Whole Brain Teaching). I often do not use all of the white spaces on the board, But the whole idea of the game is to make learning fun, and experiential…to tap into their natural way of learning so as to retain it for a life time. Learning need not always be fun, but it need not always be boring either. 13. Getting Boys To Talk We women often communicate while looking at one another eye to eye. But ever notice how men rarely do that? It is not that they do not communicate, it is that they communicate differently. Most men communicate while doing something such as playing basketball. So if your son is troubled by something, but is not talking about it: write your own cards asking him questions about what you want him to talk about, and place them in the decks provided. It is amazing how much they open up while playing. 14. Computers games can be helpful, and I use them, but not for teaching phonics. Computer games typically teach the phonic sounds incorrectly causing many children problems when it comes time to blend them to form words. This does not affect all children, but it is the number one cause of reading challenges. So make sure they are learning them correctly. We have provided a free link to help you. Note: If your children have learned the phonic sounds incorrectly, but are reading well, we do not recommend re-teaching those children. Don’t fix what is not broken. Having younger children play with older children helps them both learn from each other. The older children learn from reviewing, and helping you teach the younger ones. The younger children learn from watching the older children do their lessons….Much like the old one room school house. This is down by placing one child’s activities on the white spaces, another child’s activities on the blue spaces, and another child’s activities on the green spaces. (The game then continues as usual) The youngest only does his activities, but older children will do the activities of the younger children, and their own spaces as well. So you can teach up to three children at one time even if on different subjects. 16. Ring Around The Phonics can be used to generate extra income: (a) Tutoring can be rewarding and profitable.. But many families who are in need of such services cannot afford the high cost of a tutor. By offering to teach 3 to 4 children at a time, which is easily done with Ring Around The Phonics, one can reduce the cost to $10.00 per child per hour…very affordable for the parents, and very profitable for you. Every year parents, teachers and tutors contact us all excited to share the creative ways they are using Ring Around the Phonics to teach their children. Perhaps I will hear from you one day. We would love that. The children is why we do this. So please keep us informed. Thank you.